Sligo Cycling Campaign recently launched a local “1.5 metres please” campaign in cooperation with Sligo County Council, local bike shops and the national Stayin’ Alive at 1.5 campaign. 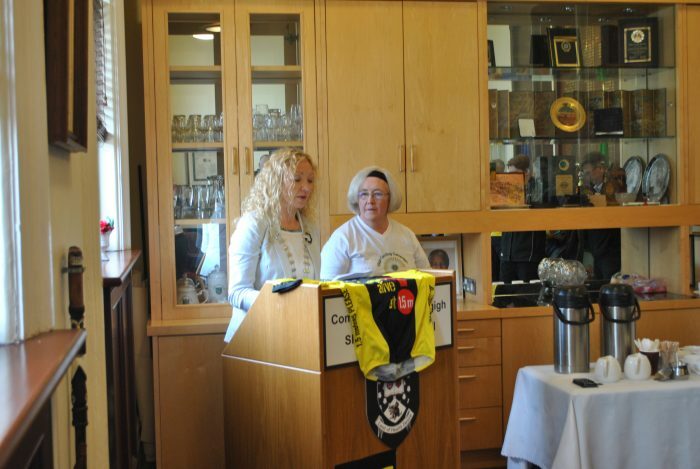 Last month, the mayor of Sligo, Councillor Marie Casserly, launched the local distribution of 500 rear windscreen stickers. Sligo Cycling Campaign obtained the template for the sticker from Wexford-based cyclist Phil Skelton, who runs Stayin Alive at 1.5, which is campaign for the introduction of a legal requirement to give 1.5m of space when overtaking a cyclist. Those who attended the launch included Sergeant Gerry Moylan from an Garda Síochána, Martin McCabe, Caroline Brennan and Val Harte from Innisfree Wheelers, Jarlath Gantly and Eddie from Wild Atlantic Ways bike hire, Deirdre Lavin and Diane Middleton Cox from Sligo Sport and Recreation Partnership, Gary Kelly from Cranmore Community Bike Scheme, Seamus Kilgannon from Sligo County Council and Imelda Harte from Mercy College Sligo of which the Mayor is a past pupil.